It was a tale of two styles at the Art Hauser Centre on Sunday. 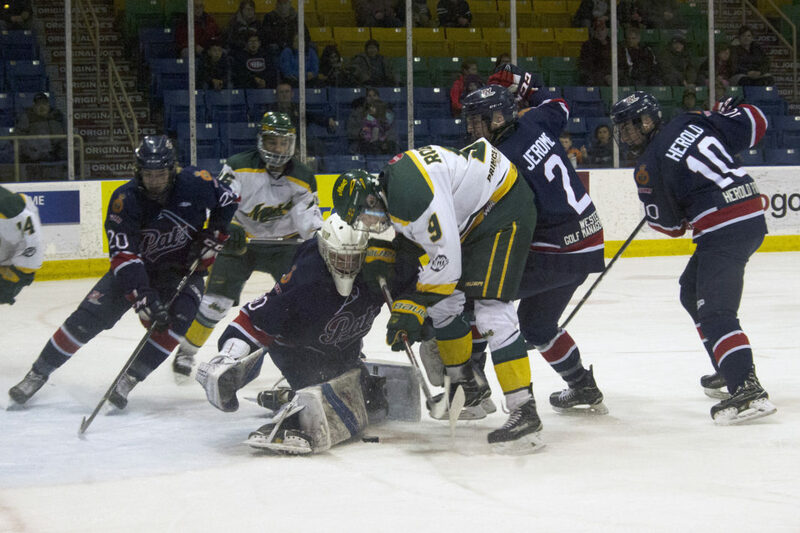 For 60 minutes, the Prince Albert Mintos and Regina Pat Canadians wore each other down with hard hits and grinding physical play, but in the midst of all that, Kyrell Sopotyk and Kishaun Gervais found a way to produce one of the finest offensive displays in Midget AAA hockey. Sopotyk’s hat trick and Gervais backbreaking third period tally, along with a 24-save shutout from Cale Elder, were enough to guide Prince Albert to a 4-0 victory, and a crucial 2-0 lead in the best-of-five semifinal series. The win was one of the stranger victories for the Mintos and head coach Ken Morrison, but they wouldn’t have it any other way. Unlike game one, where they had to battle back from an early 3-0 deficit, Prince Albert wasted little time in jumping out to a first period lead. Sopotyk opened the scoring at 7:11 when he raced around a Regina defenceman, cut across the goalmouth and slid the puck past sprawling Pat Canadians goaltender Jared Thompson for a 1-0 lead. Undaunted, the visitors open the second with fresh urgency, and a series of punishing checks that had more than a few Mintos sprawled out on the ice. However, Regina’s zealous physical play came back to haunt them when Chase Nameth took a cross-checking penalty about three and a half minutes into the period. The call set the stage for Sopotyk’s second of the night, this time on the power play. The Mintos captain victimized the Pat Canadians with speed in the first, but in the second it was a nifty bit of stickhandling that turned the Regina defence inside out, and a quick shot to the glove side that put Prince Albert up 2-0. From the other end of the ice, the goals were a welcome sight to Prince Albert netminder Cale Elder. Although Elder faced only four shots in the first period, the workload picked up significantly in the second. The Minto netminder found himself under siege at various points as a renewed Regina forecheck hemmed Prince Albert into their own end for minutes at a time. The closest the Pat Canadians came to breaking the shutout came during a late five-on-three powerplay, when Parker Hendren rattled a shot off the post. However, for the rest of the night, Elder calmly turned aside the high-powered Regina attack, and earned his first shutout of the playoffs in the process. As impressive as the Mintos’ first two goals were, Kishaun Gervais might have had the best of the night. With just five minutes to play in the third, Gervais pulled the puck between his legs and fired it into the top left hand corner in one fluid motion, all while being hacked and slashed by a pair of Regina defenders at the top of the crease. On this night, even the empty netters had an air of quality to them. After blocking a shot in his own end, Sopotyk hustled down ice where he picked a Regina defenceman’s pocket and stuffed home his third of the evening. “Sopotyk and Gervais, they have a lot of skill. They have the ability to make plays, and they were able to do that tonight,” Morrison said. Although the Mintos find themselves up 2-0, nobody is taking game three lightly. The Pat Canadians won three of four regular season matchups between the two clubs, including both games in Regina. Morrison said both the players and coaches were happy with Sunday’s effort. Now, it’s just a matter of doing it one more time. The two clubs meet again in Regina for game three on Wednesday, March 11. Puck drop is 8 p.m. at the Co-operators Centre. If necessary, game four will be played on Saturday, March 11 at the Art Hauser Centre. Game time is scheduled for 7 p.m.